JOSS STONE....THE SUPERB SOUL SINGER!!! 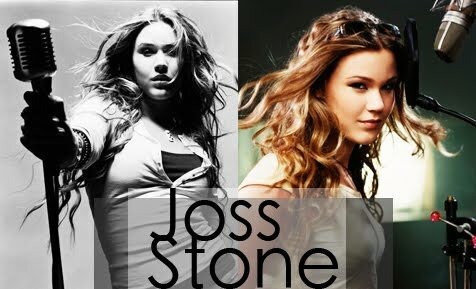 Joss Stone (born Joscelyn Eve Stoker; 11 April 1987) is an English soul and R&B singer–songwriter and actress. Stone emerged to fame in late 2003 with her multi-platinum debut album, The Soul Sessions, which made the 2004 Mercury Prize shortlist. Her second album, the equally multi platinum Mind, Body & Soul, topped the UK Albums Chart for one week and spawned the top ten hit "You Had Me", Stone's most successful single on the UK Singles Chart to date. Both album and single each received one nomination at the 2005 Grammy Awards, while Stone herself was nominated for Best New Artist, and in an annual BBC poll of music critics, Sound of 2004 was ranked fifth as a predicted breakthrough act of 2004. She became the youngest British female singer to top the UK Albums Chart in history to have her first album at number one. Stone's third album, Introducing Joss Stone, released in March 2007, achieved gold record status by the RIAA and yielded the second-ever highest debut for a British female solo artist on the Billboard 200. Stone released her fourth album, Colour Me Free, on 20 October 2009. Latest Superb Single!! "Free Me"
Awesome video and Awesome song!!... "Super Duper Love"
One of the very popular awesome song of 2005 "Right to be wrong"
Jose is really mind blowing singer and performer in R&B, Soul, Blues and Jazz genres. I will recommend her latest album "Color me free" to all. She has haunting, sensuous juicy voice with the melt of emotional ice. Her music gives light rock feel as well as jazz n blues....I love Jose Stone!!! One of the best singer among all the contemporary. Great singer!! !...2 thumbs up!! Good voice and very soothing &light music. Nice post.